Amongst Men is written by Aphiwe Namba and directed by award-winning Durban-based playwright Menzi Mkhwane who is working as the production’s producer as well as four other plays set to be staged over the next couple of months. The play features award winning Durban based actor Sbusiso Ngcobo who does a follow up solo performance after Menzi Mkhwane’s short run of Last Cow Standing at the Bat centre. Amongst Men is an intelligently crafted piece of storytelling that uses humour, cleverly constructed scenes and skilful characterization to reflect the state of South Africa and its broken humanity. “I love working with Sbusiso on Namba’s work. I think it has been long overdue. Namba is crafty, witty and often very poignant in the way that he cleverly weaves in a deep sense of understanding in the middle of the most simple of scenes in his writing. He is a natural writer who deserves as much respect as the work he puts into each word he crafts in his stories. I have constantly spoken about the fact that I want to break away from the agendas of the older generation in the arts and build new bridges that help us younger artists explore our own stories and now it is time to realise those words,” says Mkhwane. Mkhwane loves creating and staging but this year he has felt that audiences in Durban need more plays on a more consistent basis being provided to them at a consistently high level of quality. That has been the outcry. Audiences don’t get to see enough plays. So providing more stories has become the main focus for Mkhwane and his team. Aphiwe Namba has been a gift to the theatre industry in his ability to churn out so many stories at a consistent level of quality. Mkhwane partnering with Namba has provided the best platform to provide this value for Durban audiences. Namba’s next three plays will be directed by Mkhwane which will be staged over the next couple of months. In Amongst Men; Sbusiso Ngcobo plays a whopping 10 distinct characters on his own; that take an audience into deep rural KZN and other places where Fasimba the healer deals with the spiritual ills of black communities and their dying spirituality. Ngcobo uses his body, voice and imagination to bring the audience into the world of the downtrodden rural outback which he represents and portrays in a highly nuanced way. Fasimba with his ancestral power of healing also takes the audience on a journey into a day in his life. He journey to the family of Sikhakhane which he has been called to heal causes him to reveal more about his character, his thoughts, dilemmas as he unpacks his healing charms. Fasimba comments on the state of South Africa; how the real sickness has captured not the body but the spirit. It talks about a social and moral reawakening that needs to take place for the black nation in particular and South Africa at large. 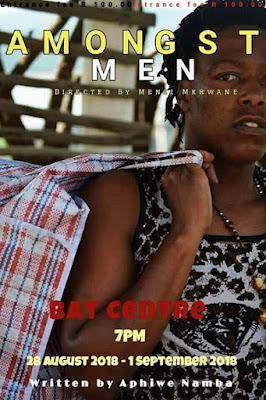 Amongst Men runs from August 28 to September 1, 2018, at 19h00 nightly at the BAT Centre. Tickets R100 purchased at the door.